All discussions about Norway in the Civil War must include information about General George Lafayette Beal, easily Norway’s most famous soldier. 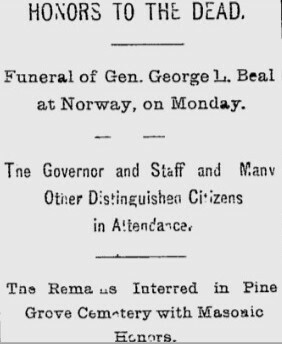 Gen. George L. Beal died very suddenly at his home in Norway on the morning of Friday, Dec, 11. Gen. Beal had returned Thursday evening from Washington, where he had been to attend a meeting of the Board of Managers of National Soldiers’ Homes, of which board he was a member. Although not in perfect health dur­ing the trip, he did not consider himself ill, and spent the evening after his return entertaining callers, and seemed in very good spirits. Early in the morning, after hearing sounds from his room indicating that he was not sleeping easily, Mrs. Beal went in and found him dead. Gen. Beal was one of the best-known citizens of Oxford County. 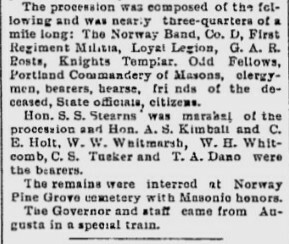 The accompanying portrait is from the Lewiston Journal, and the biographical sketch is also from the Journal. Major-General George L. Beal was born in Norway, Maine, May 21, 1825. His father was Ezra F. Beal, one of the first citizens of the town. The son, Geo. L. received his education in the common schools and at Westbrook Seminary. He took great interest in military affairs, and being always popular with his acquaint­ances, he was elected captain of the Norway Light Infantry, a position he held at the breaking out of the war, when he was employed as an express messenger. On the receipt of the news of the fall of Sumter and President Lincoln’s call for troops to put clown the rebellion, Governor Washburn promptly organized a regiment to fill the quota of Maine. Capt. Beal tendered his company for immediate service on the 20th of April, 1861, and was the first man to enlist in Oxford County. Seven days after, he took his company into camp at Portland. On the expiration of his three months’ term of service in the vicinity of Washington, he re-enlisted for two years and was commissioned colonel of the 10th Maine Infantry. His regiment covered the famous retreat of Gen. Banks from Winchester to Williamsport and participated in the battles of Cedar Mountain, Gen. Pope’s retreat and Antietam. He was severely wounded at Antietam, but quickly recovered and soon returned to duty. He was mustered out with his regiment in May, 1863, but promptly reenlisted for three years and was made colonel of the 29th Maine regiment. His command participated in the battle of the Red River and Shenandoah Valley campaigns in 1864. At the Battle of Sabine Cross Roads, La., he rendered distinguished service in the successful efforts of the 19th corps in checking the advance of the enemy and saving Banks’ army, and here he won his general’s stars. His brigade was the first to advance and break the enemy’s lines at Cedar Creek, after Sheridan had driven from Winchester, “twenty miles away,” turning defeat in the morning into a glorious victory in the afternoon. During the reconstruction times he was placed in command of the eastern district of South Carolina, with headquarters at Darlington, where he performed his duties so faithfully and so well, that he was promoted to brevet general of volunteers. In January, 1866, he was mustered out, and honorably discharged, having been nearly five years in the service of his country. Gen. Beal was a delegate to the Republican National Convention which nominated General Grant for President in 1868 and was elector at large on the ticket for that year. 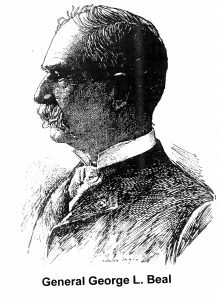 In 1872 he was appointed pension agent at Portland, which position he held with marked ability and fidelity till the office was transferred to Concord, N. H. He was the first department commander of the G. A. R. in Maine. 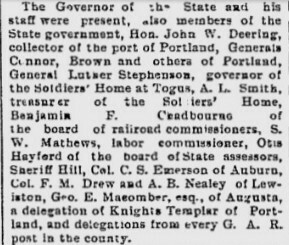 From 1880 to 1883 he was adjutant general of this state and was state treasurer from 1888 to 1894. His administration of the state’s finances was very successful, and he administered all his public offices with great credit. Gen. Beal was recently elected a member of the Board of Trustees of National Soldiers’ Homes. In his business affairs he was very active. 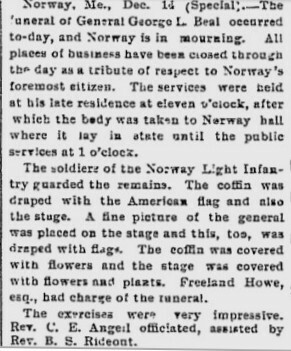 He was chief promoter of the Norway branch railroad, and later was prominent in the Paris and Norway electric road, which has proved so great a hit. He was a moving spirit in the business enterprises of his native town, pushing them to success. Such a man must be greatly and widely missed.